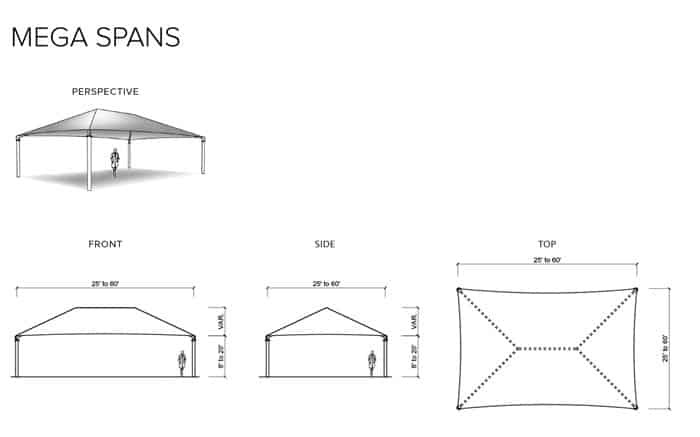 Mega Spans comprise our largest pre-engineered frame-supported shade structures, providing clear span coverage for spaces ranging from 1,000 square feet to over 5,000 square feet. Featuring heavy schedule 40 pipe columns and structural steel beams, Mega Span steel frames are shipped as easy-to-assembly bolt-together components requiring no in-field welding or fabrication. Of course, Mega Spans feature our remarkable shade fabric in a variety of colors for maximum air cooling and protection from up to 99% of the sun’s dangerous U.V. rays. Plus, removal and re-attachment of the canopy is a breeze, since our innovative quick-release canopy fastening system is built right in! 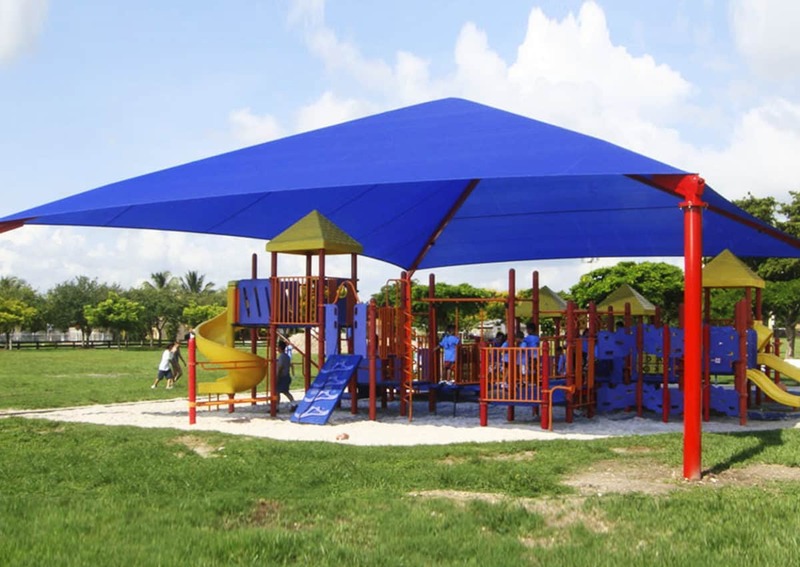 For the best sun protection products, choose our extensive line of shade structures, umbrellas, tents, canopies, and sun shelters to cover playgrounds, bleachers, dugouts, sports fields, pool areas, waterplay and waterpark areas, concessions, and other outdoor spaces where protection is needed from the sun’s harmful U.V. rays. Single Post Pyramids and Single Post Umbrellas are cleverly engineered with just one central support post, making them ideal for smaller shaded areas. Perfect applications include poolside, at water parks, for seating by the playground, and even in a sandbox to keep toddlers cool and shaded. Single Post Pyramids are available in sizes up to a generous 20’ x20’, while Single Post Umbrellas go up to a 25’ diameter. All Single Post shade systems feature our remarkable shade fabric in a variety of colors for maximum air cooling and protection from up to 99% of the sun’s dangerous U.V. rays. Plus, removal and re-attachment of the canopy is a breeze, since our quick-release canopy fastening system is built right in! Double Post Ideal for applications where the number of posts must be kept to a minimum, Double Post Hip design is engineered to provide a maximum of shade with the fewest possible post obstructions. Double Post Hips are ideal for tennis and other sport courts, poolside, water parks, and anywhere else an economical shade is desired for seating or tables. Double Post Hips feature our remarkable shade fabric in a variety of colors for maximum air cooling and protection from up to 99% of the sun’s dangerous U.V. rays. Plus, removal and re-attachment of the canopy is a breeze, since our innovative quick-release canopy fastening system is built right in! Single Cantilevers are ingeniously engineered to keep the support posts to only one side, thereby creating a large shaded space for obstacle-free circulation. Especially near pools and other water activities where posts are not desirable close to the water, Single Cantilevers provide the ideal solution for arranging seating and tables. Our shades are also perfect for bleachers and sports fields for unobstructed sports viewing while enjoying cool comfort and sun protection.